You’ve probably seen the sign above hung around downtown, or been handed one at the terminal recently. 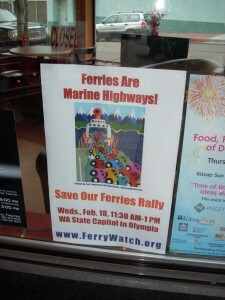 It’s donated artwork from a Port Townsend painter that the Citizen’s Plan C group has sent around the peninsula, to gather momentum for its cause in ferry communities. There are five or six different versions. 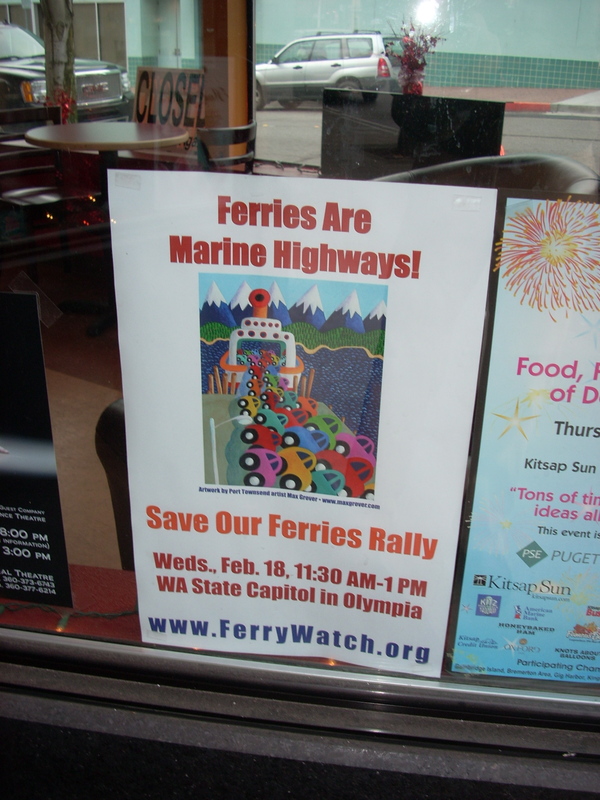 That group’s next big push is Wednesday the 18th, when ferry riders from around the Sound are scheduled to rally at the Capitol in Olympia. Last I heard they were still looking for Bremerton riders to participate and represent the route. If you’re interested in joining or hosting a carpool from our fair city, email debbilester@yahoo.com. Bremerton-Seattle ferry service, branded last week as “neglected” by state ferries management, will top the agenda of the Toll Bridge Authority meeting in Olympia on Wednesday. Lester M. Lewis, chairman of the Committee for Improved Bremerton-Seattle Ferry Service, said his group is seeking assignment of more adequate vessels to the route along with improved landing facilities and better scheduling. “For the first time, Bremerton has been promised serious, top-level consideration of its case,” Lewis said. A committee dedicated to improving Bremerton service! And the group of residents facing the same worries we are now! I guess that even though times change, some things stay the… oh, right.